I don’t want to get on this train. Unbeknownst to Fred Spiegel, a Jewish boy living in Germany during World War II, a train that Germans were forcing him and about 70 other people onto was headed for Sobibór, Poland, a death camp. His cousin, who was a year older and who was also being pressed onboard, heard him, and added to the shouting. The German officials held the pair back because they were making so much noise, said Spiegel, now 79. He recounted his story Wednesday to hundreds of Hudson Falls high school students as part of a Day of Remembrance, at which he was one of several speakers. “If I and my cousin Alfred hadn’t made that commotion, I wouldn’t be standing here today,” he said. Spiegel spoke for about an hour to hundreds of people in the school auditorium, emphasizing how kismet kept him off the wrong trains and on the right ones. Despite the 6 million Jews killed during World War II, he wasn’t one of the 1.5 million children the Nazi Party slaughtered in extermination camps. He was unaware of the train’s true destination until after the war, he said. The extermination camps were called resettlement or work camps. “People never in their wildest mind thought there were death camps,” he said. 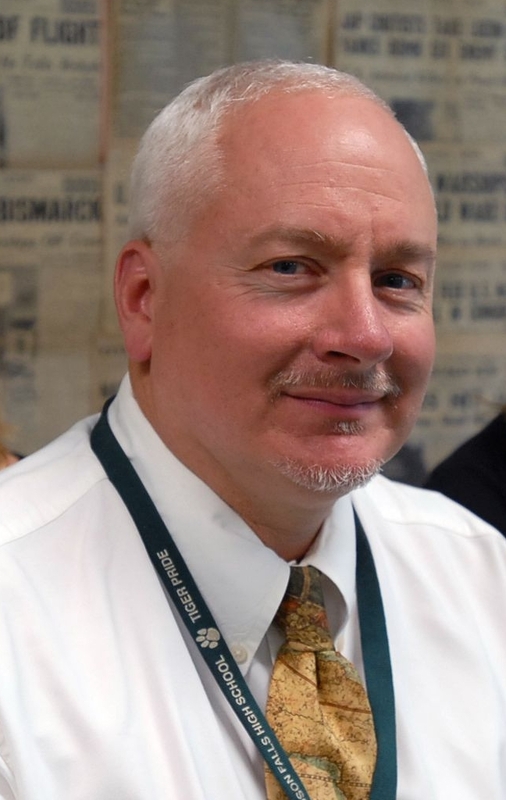 Although Spiegel published his autobiographical and family memoir, “Once the Acacias Bloomed,” in 2004, he learned more about his story four years ago because of a Hudson Falls teacher. Social studies teacher Matt Rozell, while working on a World War II project with his class, received photos from a soldier who had taken part in liberating a trainload of Jewish prisoners near Magdeburg, Germany. The class put together a website – the World War II Living History Project – and posted the photos. The photos showed U.S. forces liberating prisoners from the Bergen-Belsen concentration camp, one of whom was Spiegel, from an abandoned train near the River Elbe. Spiegel contacted Rozell and, in 2007, he and two other survivors from the train, were reunited at the school with one of their liberators – Carrol Walsh, a retired state judge. The World War II Living History Project website has since discovered 200 more people who are survivors from that train and Rozell is leaving Monday for a trip to Israel, where he will speak before dozens of the survivors and their families. Rozell will also meet in Israel with Frank Towers, a U.S. soldier who was one of the liberators; and the U.S. ambassador to Israel. 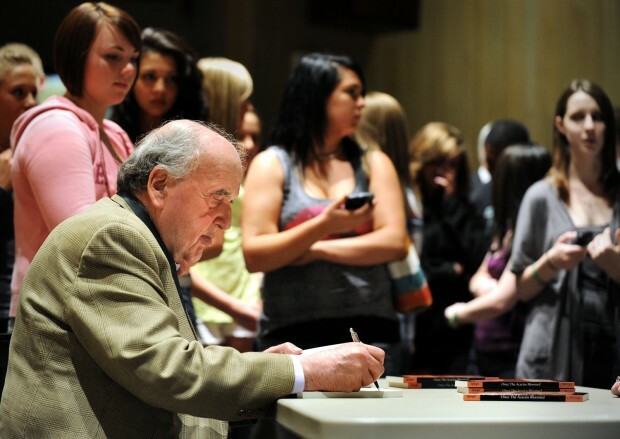 The district has continued Holocaust remembrance efforts, seeking to hold an event every year, Rozell said, and Spiegel has visited several times. David Fish, a sophomore, said the event was optional, but students all decided to attend because of the event’s importance. Some of his friends bought Spiegel’s book, he said. Two other trains that left Magdeburg were also stopped by Allied troops, Spiegel said, but days later, which made food scarce for passengers. He also said, of about 30,000 people sent to Sobibór from Magdeburg [correction: Westerbork], 19 returned home. Fred Spiegel- Once the Acacias Bloomed/Memories of a Childhood Lost. 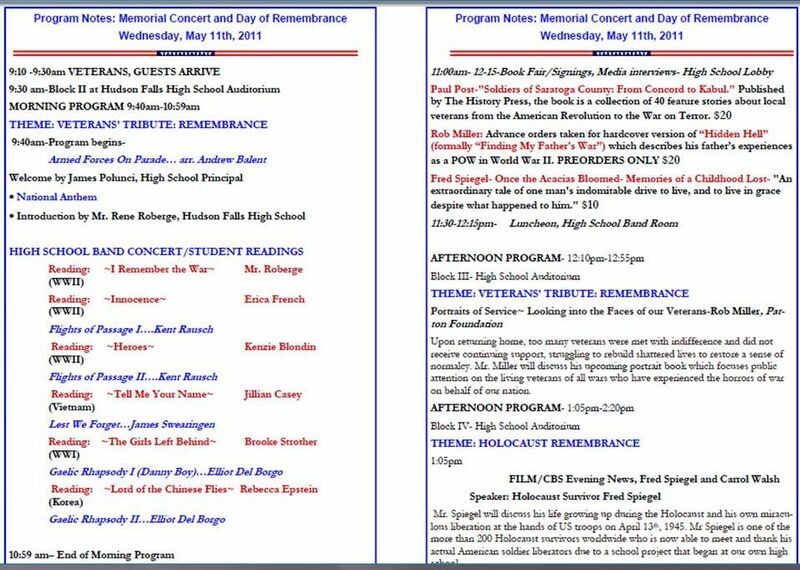 Memorial Concert and Day of Remembrance. Yesterday our high school hosted an incredible Memorial Concert and Day of Remembrance in forward observance of Memorial Day and also to recall the victims of the Holocaust. I produced the program that featured readings by our talented high school seniors and the band under the direction of Mr. Scott Larsen. Mr. Roberge again served as our masterful MC. Thanks to all students and staff who made it possible. Thanks to Rob Miller and Fred Spiegel for traveling to be with us to share their stories and their books. You can enjoy their presentations by streaming the links below. Because band director Scott Larsen was already planning a concert with a Memorial Day theme, Rozell said school officials thought it would be nice to include the community in a day of remembrance. Spiegel is one of more than 200 holocaust survivors whom Rozell has located that were on a train that was en route to a death camp in April 1945 before a U.S. tank battalion scared off Nazi troops guarding the train. Rozell and his Hudson Falls history classes launched a website about the liberation of the 2,000 Jews from that train near Magdeburg, Germany. The website has helped to reunite members of the tank battalion with the former Jewish captives. Rozell will speak at a formal gathering to honor the liberators next week in Israel, which is known as the first refuge for many Holocaust survivors. At the Israeli event, Rozell said he will speak before several dozen survivors and their families, as well as liberator Frank Towers and the U.S. ambassador to Israel. His tour will bring him to Yad Vashem, Israel’s Holocaust Memorial. https://teachinghistorymatters.wordpress.com/rozell-trip/ in order to go. 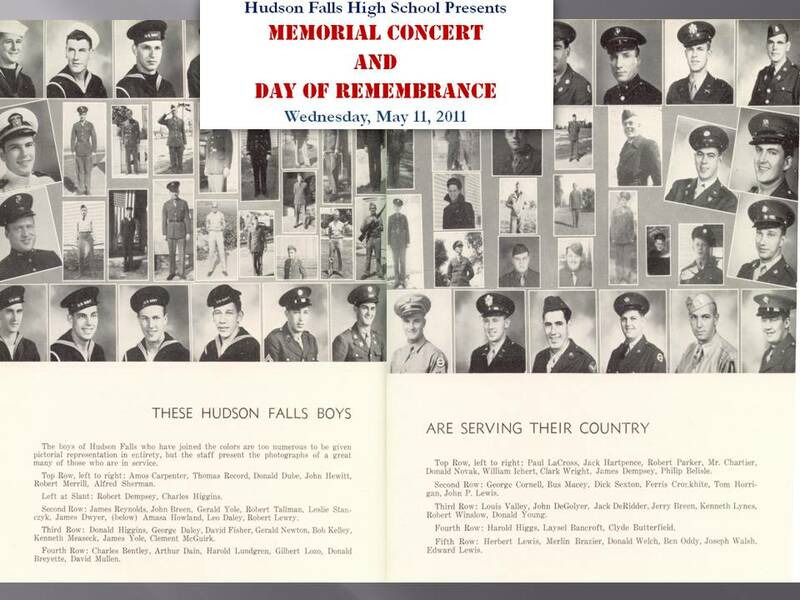 Wednesday’s concert and remembrance event at the high school will also include a luncheon in the band room for veterans and their families at 11:30 a.m., followed by presentations from Spiegel and from Rob Miller, author of “Hidden Hell,” which describes his father’s experiences as a prisoner of war in World War II. With those two words, after much contemplation, Supreme Allied Commander Dwight David Eisenhower made the decision to commit over 1 million men to free a continent. Photo by Kris Dreessen, SUNY Geneseo. Many of these soldiers would not survive. Many other lives would be unalterably changed as they uncovered the evidence of the greatest crime in the history of the world, the Holocaust. And the moral path chosen, to stop and give aid and comfort, in the middle of a shooting war, is responsible for many lives today. Very shortly, I will be meeting over 400 persons who are alive today because of the soldiers taking the time to stop, rescue and comfort survivors who were literally moments away from death. Many of them will be together again for the first time since 1945- due to our small school project and the ripple effects that are reverberating worldwide. I have also made an important personal decision. As I struggle to work on my book, an important piece is missing. It’s time to go. Can you believe that with our school project, we have located over 200 Holocaust survivors who were liberated on that train near Magdeburg on April 13th, 1945? In March, 2006, I heard from the first child survivor, a grandmother in Australia. Fast forward to April 2011, an Israeli daily paper with a circulation of 250,000 ran a front page cover story in their magazine about our school project, thanks to second generation survivor Varda W., who has located 70 other survivors there. As you may know, she has organized a reunion in Israel in May. 60+ survivors and their families will be there to meet one of our liberators, and I will have the opportunity to meet them all, as well as the US Ambassador and other dignitaries. I am going with my son Ned, who is age 13, and we are in the process of beginning to raising funds. It is important to me that I travel to Israel at this time; later, I hope to travel to Germany to trace the journey of the soldiers and the train near Magdeburg. The post at the link below explains how you can help me continue this work. If you know me, you probably know that this work is very personal to me, and to my students. Many of the survivors and liberators have become my friends; many more I hope to meet in the near future. I am sending a donation for you and your son, so you can use toward your trip to Israel. This is in appreciation for all you are doing to tell our story. When you are in Israel remember that I spent my best 20 years there. When you visit Bergen-Belsen, remember that I spent 4 years of my childhood there-2 years in a concentration camp and 2 years in a D.P. camp. When you visit Farsleben, ask them to take you to Hillersleben, when you are there you will see the hospital from a distance. Remember that I spent 6 weeks there, and 3 weeks of which I was unconscious. Have a great trip! I hope to hear from you when you come back.